Guppies are one of the most common freshwater tropical fish you’ll find in your local pet store. 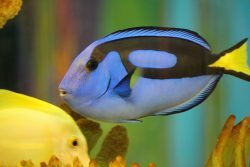 They’re colorful, cute and easy to care for, which makes them a popular fish for the beginner hobbyist. One of the reasons guppies are so popular is their vivid colors and patterns. Guppies come in virtually any color you can think of — even metallic colors, which are the result of this fish’s cells called iridophores. These cells don’t have any color themselves, but rather they reflect light. This gives them a unique, radiant, luminescent look. While there are many varieties of guppies, they all are essentially the same species. The common guppy, also called fancy guppies, you’re likely to find in the pet store is a member of the Poeciliidae family and while there are hundreds of varieties, the Poecilia reticulata is considered to be the most widely accepted name for the species. If you’ve gone to a few different pet stores and marveled at the variety guppies they have, just know that breeders are constantly coming up with new types or strains all the time. For our purposes, we’re going to look at some of the more popular types of guppies and discuss how best to care for them, and how to breed them. Guppies are often differentiated by their colors/patterns and their fin types. Common guppies or fancy guppies are selectively bred to have several different fin types, which are: fain tail, delta/triangle tail, veil tail, flag tail, double sword tail, top sword tail, bottom sword tail, lyre tail, pin tail (also called needle tail), spade tail (also called coffer tail), spear tail and round tail. Poecilia reticulata is the common fancy guppy that you’ll find in most pet stores. Poecilia wingei is sometimes called the Endler Guppy and is a close relative to the common guppy fish mentioned above. 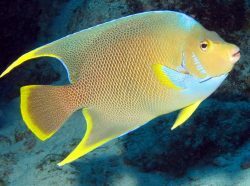 This fish isn’t commonly found in pet stores, but hobbyists can get them if they so choose. Micropoecilia picta is a smaller fish than the other two varieties and is mostly found in brackish waters. Metal Guppies: As mentioned, these fish get their metallic sheen from reflective cells, which makes them appear luminescent. Solid Guppies: Many guppies exhibit wild patterns and bold colors, but these guppies fish are mainly bred with solid colors of greens, blues, reds and yellows. Albino Guppies: Albinos are distinctive because of their red eyes and lack of color. Their bodies are mostly white or pale yellow. 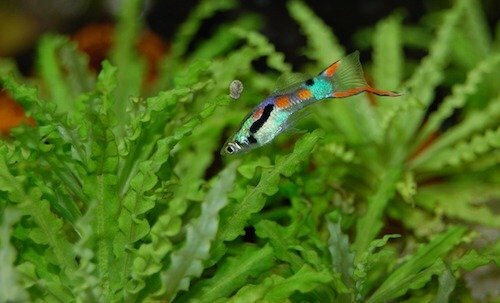 Real Red Eye Guppies: These guppie fish are so named because they have red eyes. 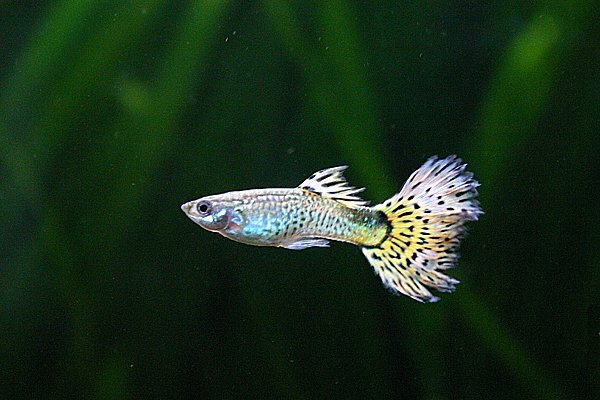 Cobra Guppies: The cobra guppy is sometimes called the Millions Fish. These fish originate from Singapore, but are now mostly farm raised as are most guppy fish. The cobra guppy has distinctive snake-like patterns on their bodies and are usually found with vibrant green, yellow and black coloring. Tuxedo Guppies: The tuxedo guppy has light and dark colorings for the front and back half of its body. The light to dark coloring makes people think of a tuxedo with the white or light colored jacket and dark pants. 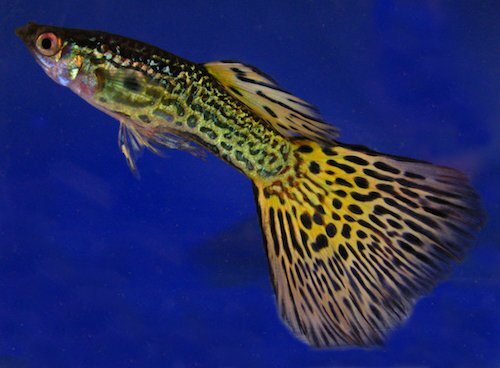 Snakeskin Guppies: The snakeskin guppy is named because of the chain link pattern covering its body that resembles snake scales. Guppies are found in nearly every pet store. 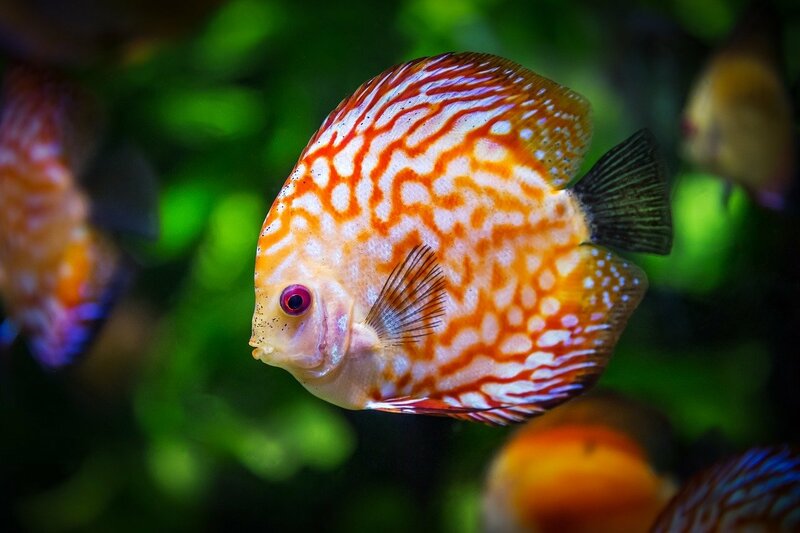 They are a very hardy fish, and they mature quickly, which makes them ideal for those new to the fish keeping hobby and to those interested in breeding this fish. Guppys can be kept alone but do better with two or three in a tank. If you plan to keep both male and female, it's recommended to keep a 1:2 or 1:3 ration of male to female so that the females don't get stressed out by the males attention. Guppies grow to about 2 inches and it’s recommended that they be put in a tank that’s a minimum of 20 gallons, although you can get by with a smaller tank, provided you don’t crowd. These freshwater tropical fish can withstand a wide water temperature range, from 64˚- 82˚ Fahrenheit with a pH of 5.5-8.0. The fact that these fish do well in a wide-range of water conditions make them ideal for the beginner, however, you should be careful not to change pH or temperature too dramatically too quickly, or you could kill the fish. You can keep your guppie fish happy if you do a twenty percent water change every week. Be sure to siphon the water from the bottom to get rid of unwanted debris, food and waste, which can lead to a spike in nitrates and harm your fish. Guppy fish are very docile fish and generally get along well in a community tank, however, they are often the targets of “nippers” or aggressive fish that like to nip the fins of other fish. It’s not uncommon to see guppies with their tails torn to shreds when they’re put into a community tank with barbs, silver dollars and zebra danios and other territorial fish. Guppies are omnivores and will be happy on any good quality flake food, freeze-dried bloodworms, tubifex worms and brine shrimp. Guppy fish also like white worms, which are found in the wild in dead plants or under stones, but you can get these in your pet store. When feeding guppies, it’s recommended that you feed them several small meals a day rather than one or two large ones. You need to be especially mindful of this if you have baby guppies in your tank because if the parents get hungry, they may eat the fry. Unlike many kinds of freshwater tropical fish, one can easily discern the male from the female guppies. The male guppy is the more colorful of the two and has a wide, colorful, fan-like tail. The female’s tail is noticeably more compact. Breeding guppies is relatively easy — some would say too easy. It’s not uncommon to get a breeding pair that simply won’t stop and you end up with more guppies than the pet store. When it comes time to breed, it’s recommended that your tank have floating vegetation, such as ferns, and a breeding box to protect the young from parental predation. 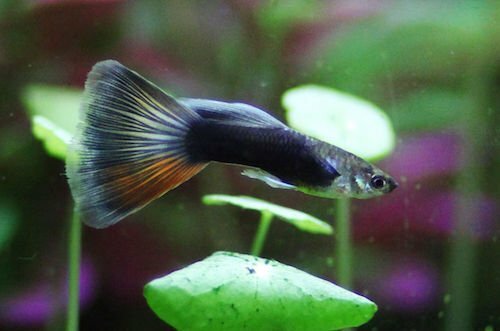 Guppies are an excellent choice for the beginning hobbyist because they come in a wide range of colors and patterns, they’re found in virtually every pet store, and because they’re exceptionally easy to care for. With regular water changes and proper feeding, there’s no reason your guppies shouldn’t provide you with years of enjoyment.